We think everyone should experience the joys of hen keeping because, frankly, they are wonderful, caring, compassionate creatures. Many schools choose to adopt our hens because, not only are they friendly, endearing pets, but they are also a great educational tool. There are some things to consider before adopting ex-bats, so we’ve put together a handy guide which should tell you everything you need to know. Once you’ve had a good read and are satisfied you’ve considered everything involved, simply give us a call on 01884 860084 to speak to our re-homing team about booking your girls! You can also find out about our learning programme, specifically designed to help primary school children learn with hens. 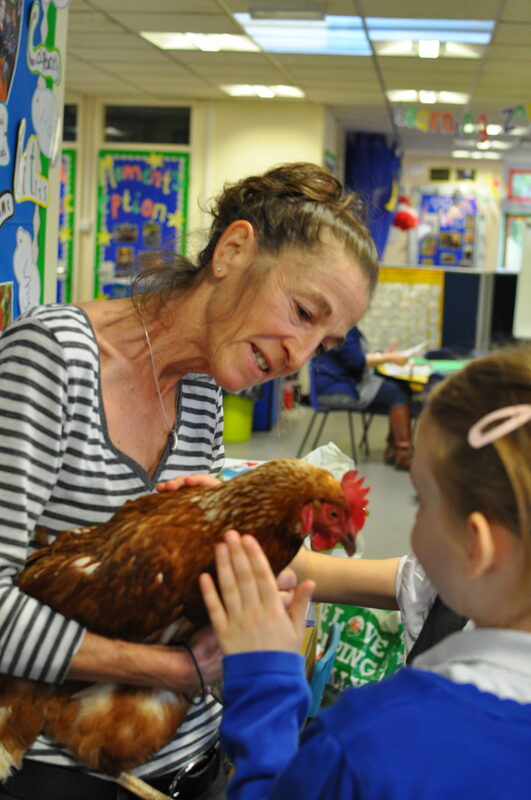 Even if you aren’t sure about re-homing hens yourself, one of our friendly volunteers can host a workshop at your school and bring their own hens for the children to see. If you’re set on re-homing some hens yourself, here is a sample ‘animals in school’ policy as well as a sample risk assessment for you to consider adapting.